Description: Calculates the normal depth of a parabolic channel in the form of y = Cx^2, where C is the x^2 coefficient or curvature coefficient. The channel depth and width or any other known depth and width must be entered to describe the curvature of the parabola. 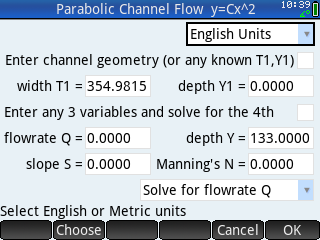 Enter any three of the four variables (flow rate, depth, slope, and n) and solve for the fourth variable. The wetted perimeter P is calculated using the exact formula per Chow as redefined by Merkley. Includes comprehensive PDF documentation.